This test demonstrate the ability of certain bacteria to decompose the amino acid tryptophane to indole, which accumulates in the medium. Indole production test is important in the identification of Enterobacteria. Most strains of E. coli, P. vulgaris, P. rettgeri, M. morgani and Providencia species break down the amino acid tryptophan with the release of indole. This is performed by a chain of a number of different intracellular enzymes, a system generally referred to as “tryptophanase.” It is used as part of the IMViC procedures,a tests designed to distinguish among members of the family Enterobacteriaceae. A variation on this test using Ehrlich’s reagent (using ethyl alcohol in place of isoamyl alcohol, developed by Paul Ehrlich) is used when performing the test on non-fermenters and anaerobes. Tryptophan is an amino acid that can undergo deamination and hydrolysis by bacteria that express tryptophanase enzyme. Indole is generated by reductive deamination from tryptophan via the intermediate molecule indolepyruvic acid. Tryptophanase catalyzes the deamination reaction, during which the amine (-NH2) group of the tryptophan molecule is removed. Final products of the reaction are indole, pyruvic acid, ammonium (NH4+) and energy. Pyridoxal phosphate is required as a coenzyme. When indole is combined with Kovac’s Reagent (which contains hydrochloric acid and p-dimethylaminobenzaldehyde in amyl alcohol) the solution turns from yellow to cherry red. Because amyl alcohol is not water soluble, the red coloration will form in an oily layer at the top of the broth. 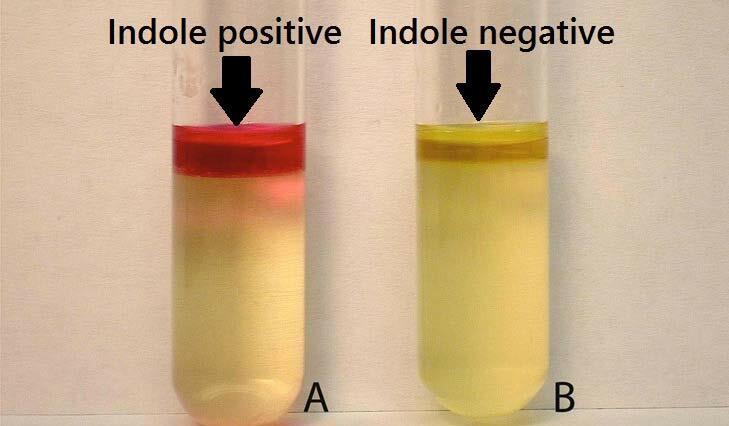 In the spot test, indole combines, in the filter paper matrix, at an acid pH with p-Dimethylaminocinnamaldehyde (DMACA) to produce a blue to blue-green compound. Indole Spot Reagent has been reported to be useful in detecting indole production by members of the family Enterobacteriaceae and certain anaerobic species. * Adjusted and/or supplemented as required to meet performance criteria. Take a sterilized test tubes containing 4 ml of tryptophan broth. Inoculate the tube aseptically by taking the growth from 18 to 24 hrs culture. Incubate the tube at 37°C for 24-28 hours. Add 0.5 ml of Kovac’s reagent to the broth culture. Observe for the presence or absence of ring. Place several drops of Indole Spot Reagent on a piece of filter paper. With an inoculating loop or wooden applicator stick, pick a portion of an 18-24 hour isolated colony from a non-selective media and rub it onto the reagent saturated area of the filter paper. Positive: Formation of a pink to red color (“cherry-red ring”) in the reagent layer on top of the medium within seconds of adding the reagent. Examples: Aeromonas hydrophila, Aeromonas punctata, Bacillus alvei,Edwardsiella sp., Escherichia coli, Flavobacterium sp., Haemophilus influenzae, Klebsiella oxytoca, Proteus sp. (not P. mirabilis and P. penneri), Plesiomonas shigelloides,Pasteurella multocida, Pasteurella pneumotropica, Enterococcus faecalis, and Vibrio sp. Negative: No color change even after the addition of appropriate reagent. Examples: Actinobacillus spp., Aeromonas salmonicida, Alcaligenes sp., most Bacillus sp., Bordetella sp., Enterobacter sp., Lactobacillus spp., most Haemophilus sp., most Klebsiella sp., Neisseria sp., Pasteurella haemolytica, Pasteurella ureae, Proteus mirabilis, P. penneri, Pseudomonas sp.,Salmonella sp., Serratia sp., Yersinia sp. Positive reaction: The development of a blue colour within 3 minutes. Negative reaction: The development of a pink colour within 3 minutes. To differentiate Proteus mirabilis (indole negative) from all other Proteus species (indole positive). To differentiate Klebssiella pneumoniae (indole negative) from Klebsiella oxytoca (indole positive). To differentiate Citrobacter freundii (indole negative) from Citrobacter koseri (indole positive). Indole tests may be used as an aid in the identification and differentiation of gram-positive and gram-negative organisms. Additional biochemical testing using pure cultures is recommended for complete identification. The tube test is a more sensitive method of detecting indole than the spot test. When performing a spot test, Kovacs Indole Reagent may be used as a substitute for the spot test reagent. However, Kovacs Indole Reagent, when used as the spot test reagent, is less sensitive in detecting indole than the Indole Spot Reagent (DMACA). Kovacs Indole Reagent is not recommended for use with anaerobic bacteria. The Indole Spot Reagent (DMACA) is suitable for anaerobe use. Since peptones have been shown to vary with regard to their suitability for use with indole testing, media selected for indole determination should be tested with known positive and negative organisms to insure suitability. Media containing glucose should not be used for indole testing due to the formation of acid end products which have been shown to reduce indole production. Mueller Hinton Agar should also not be used for this test because tryptophan is destroyed during acid hydrolysis of casein. Media containing dye, such as MacConkey and EMB, are unsuitable sources of inoculum due to possible carryover of dye and subsequent interference of indole color interpretation. Indole-positive colonies have been reported to cause adjacent indole-negative colonies to appear false-positive due to diffusion of indole into the media. To avoid false-positives, select colonies of different morphologies that are separated by at least 5mm for indole testing. Which reagent among Kovacs and ehrlichs is more sensitive? Do candida species answers to indole test??? why E.coli give positive result at 42 celsius in this test ?